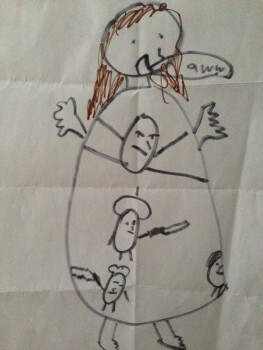 My daughter Lily’s visual interpretation of what it feels like to be glutened (she did this drawing when she was 8). Those little bean-shaped things in her tummy are “gluten guys” that she says are “karate chopping, stabbing and punching” her. I’m not sure why they’re wearing berets. 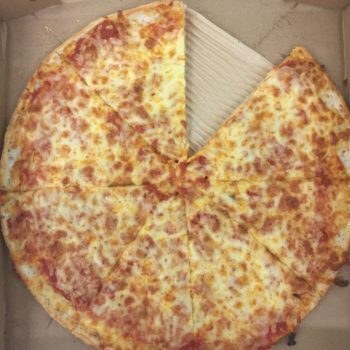 Just yesterday I was on my way to pizza lunch, thinking how lucky we are that the school orders gluten-free pizza for the handful of kids with celiac disease and a few other students who eat it for various reasons. My daughters so look forward to pizza lunch, especially Lily, because she gets to participate in a social food ritual at school with her friends and not feel different or left out. I volunteer at every pizza lunch, to make sure things go smoothly and because my kids like having me there. I’m always stationed at the gluten-free table, where Lily comes to get her pizza and gathers around to eat lunch with her sister and friends. We love these monthly Friday pizza parties, and for the most part* things have gone smoothly. The school orders from Pizza Nova; the pizza tastes good, we’ve had it many times and we’ve never had an issue. Pizza Nova gluten-free pizza always comes with this sticker on the box. Until last week. 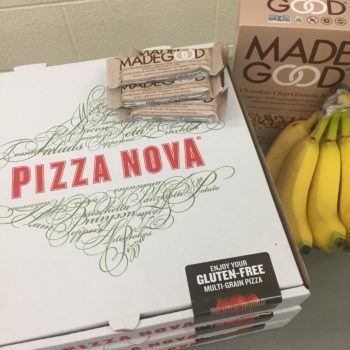 I showed up at school to set up the gluten-free table and there were the three medium-sized boxes from Pizza Nova (the regular pizza the school orders is from a local parlour). I noticed that the gluten-free stickers weren’t on the boxes, which raised a flag, so I checked with the mother in charge of pizza lunch. She assured me that the pizza was gluten free because she was the one who made the order. I thought, maybe they ran out of the stickers or forgot to put them on. When I opened one of the boxes, I noticed that the crust looked pretty fluffy. So I asked the other mother there with me that day, whose two children and husband have celiac disease, if it looked all right to her. She thought it did. We served the first slice to a little girl in my daughter’s grade who I’ve never seen at the gluten-free table. Ever curious about why people eat gluten free, I asked her why she was getting the GF pizza and she said because sometimes she gets a stomach ache when she eats wheat. Then Lily arrived, I doled out her two slices and she took a big bite out of one. As she was digging into her second bite, I noticed that the crust of the slice in her hand looked puffy, so I asked if I could try a bite. The moment I bit into the chewy pizza I told Lily to stop eating it. This pizza was not gluten free. The gluten-free pizza is not fluffy or puffy or chewy. It’s crunchy, made on a hard rice-flour-based crust. I called over the mom in charge of pizza lunch and this time told her that the pizza was definitely not gluten free. She immediately called Pizza Nova and then told me that they screwed up the order. They were going to deliver three gluten-free pizzas right away. In the meantime, a small group of kids had gathered around the table, waiting for their lunch. I was upset. I know how sensitive Lily is to gluten. I knew what was probably going to happen to her but I tried to be optimistic for Lily’s sake. “It was only two bites,” I told her. “Drink a lot of water. 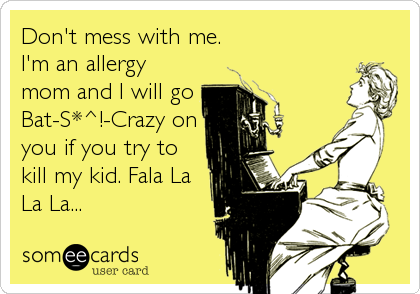 Hopefully you won’t get sick.” Then the pizza lunch mom came up to me with tears in her eyes and remorsefully told me that it was actually her fault; she didn’t press the “gluten free” button when she ordered the pizza online. Though I was fuming on the inside, I didn’t want to cause a scene or make her feel bad. I understand that people make mistakes. But this was one mistake that could make my daughter sick. Thankfully, only Lily and one other girl had eaten some of the gluten pizza. We spoke to the other girl and the vice-principal called her mother to tell her what happened. Her mother said it was OK, her daughter wasn’t going to get sick, she might just have a bit of a tummy ache. As we waited for the real gluten-free pizza to arrive, I asked Lily if she wanted to come home with me in case she got sick. She wanted to stay at school because she was feeling OK (after being glutened it usually takes 2 hours for her to react). And I don’t think she wanted to bring any more attention to herself. After the real gluten-free pizza finally arrived and we served it to the kids, the pizza lunch mom pulled me aside to apologize again. She was visibly upset and obviously felt terrible about it. I told her that I understood, it was a mistake and we should all learn from it. I left the school feeling sorry for this mom because I could see how bad she felt. Sure enough, about two hours later I got the call from school that Lily had thrown up. On my way to pick her up, I could feel the anger rising up in me. Why was I consoling the pizza mom more than my daughter? Why did I leave the school feeling bad for her? It was my kid who got glutened, who was suffering the consequences. And where was the principal in all this? I felt like the situation was not taken seriously enough. Truth be told, I was angry at myself. There were two warning signs before Lily took that first bite: the missing stickers on the pizza boxes and the fluffy, doughy crust. Why didn’t I trust my gut and try out the pizza myself before serving it to the kids? Even though I consider myself an advocate, even though I am vocal and I blog and I’m out there in the gluten-free community, there are still situations where I don’t want to be THAT mother, the pushy one making demands and getting all up in everyone’s grill. 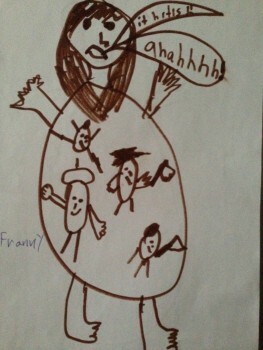 But now I realize that Lily needs me to be that mother. She’s only 8, and though she’s learning how to ask the right questions, she’s not old enough yet to have the knowledge or confidence or chutzpah to advocate for herself. So from now on, no more Mrs. Nice Mom! *The only other time we had a negative experience at pizza lunch was the day I was standing around the gluten-free pizza table with my daughter and two of her friends (one who also has celiac) and a teacher walked by and asked what kind of pizza we had. We told him it was gluten free. And then he said, right in front of the kids who were eating said pizza: “I could put cheese on a piece of cardboard and it would taste better than that.” Beyond. Shocked. When I told him that wasn’t a nice thing to say, he said he was just joking. Who says that!? These kids feel different enough when it comes to food…why make them feel worse? Urgh.